All this week I’m celebrating the River Wandle which flows happily down near my house. And to celebrate it, I decided to walk the whole length of the 13 mile Wandle Trail. Yesterday I did the first bit in the borough of Croydon and saw no water. 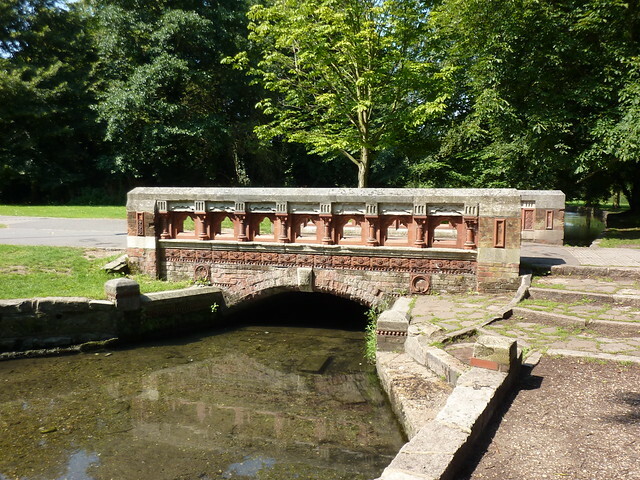 But at Waddon Ponds the Wandle does start and that’s where the Wandle Trail enters Sutton. There are two sources to the Wandle and one is at Waddon Ponds where swans and geese glide effortlessly across the water, and small children try to offer them bread to eat. The Wandle Trail doesn’t actually go into the park but instead heads down a bridleway next to a business park and the route finally enters Sutton with footpath signs aplenty. There are nettles alongside the path and I accidentally brush against them; my arm throbbing for some time after. The embryonic Wandle is wider than you’d expect – about 2m or so although not very deep – and the path stays a respectful distance from the houses on either side. Beddington Mill looks rather out of place amongst the houses. A tall Victorian building, it sits on the site of a medieval mill. Corn, and later tobacco, were ground there. In recent years a clutch company used to operate there but now it looks quiet and silent. More residential streets lead the Wandle on to Beddington Park. The small river is mostly walled in, caged lest it wanted to spread its wings too much. Small man-made weirs occasionally give the river a sense of urgency, before calming down once more as it flows on to the backdrop of young kids playing somewhere nearby. Now a school, for much of its 500 years Carew Manor was a family home. 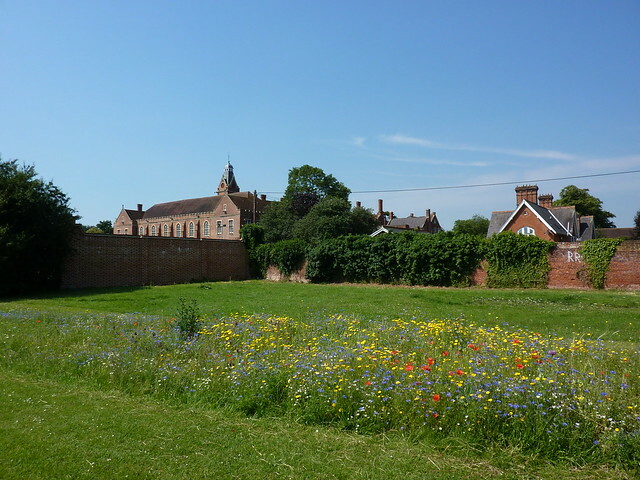 It’s supposed to be an interesting building, much of it over 500 years old but it’s hidden behind fences and trees leaving me to admire instead a thing strip of wild flowers which is full of happy bees. We once found a fledgling pigeon stuck, dumfounded, near our local Sainsburys and after much wondering what to do with it. It eventually was dropped off at the Riverside Animal Centre who do sterling work in helping wild animals. I passed by them now, sat in a corner of the park, before crossing a terracotta bridge. They couldn’t help the pigeon in the end, and the bridge wasn’t useful either – the Trail didn’t require its use. In a small wooded area I spot a tiny stream feeding into the river. Water bubbles out of nowhere and flows along before meeting up with the Wandle a few metres away. There aren’t many tributaries to the Wandle and this one probably doesn’t make a major impact, but it’s nice to see nature doing its thing. The Wandle’s slowly getting bigger and deeper and its first wildlife comes into view. Coots and their young paddle happily whilst geese and ducks lazily paddle on whilst dogs crash and splash in the same water. 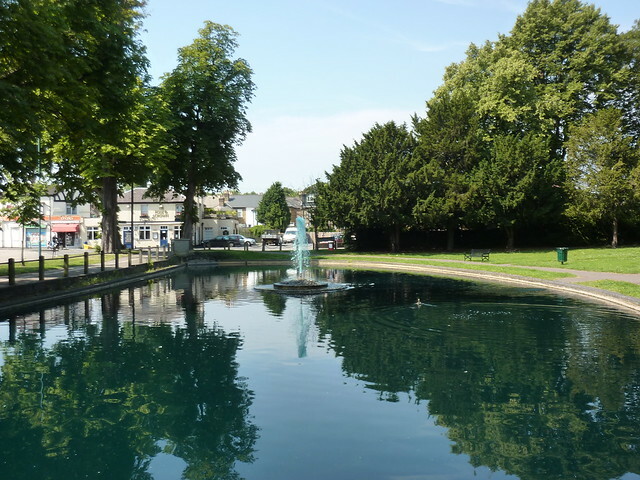 It’s a lovely park to dawdle in however soon its time to leave and head back on the roads towards Elms Pond where a fountain is pumping out turquoise coloured water. Just after the pond I follow a sign, accidentally taking a “short cut” that means I’ve bypassed Carshalton Ponds which are the second source of the Wandle. 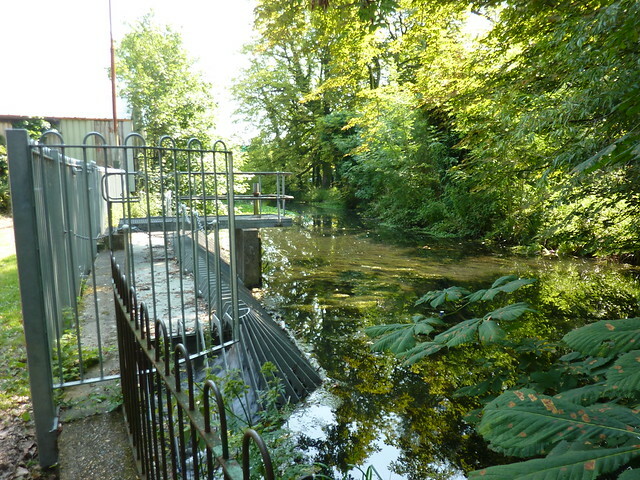 The Carshalton arm meets the Waddon one near Wilderness Island where they join together noisily at a weir with a large grill. The Island isn’t really one – just a patch of land bordered on two sides by the Wandles and is where the London Wildlife Trust own a nature reserve. I idly wander through it, trying to keep my eyes and ears open for the thirty different bird species that live there. A sign at the entrance proclaims a tawny owl has been seen there, and they hope it’s one of a pair. All I see are some large tadpoles and a dead bee floating away in a stream. Given the urban sprawl on all sides, it’s a quiet, rather tranquil place. One to tarry in awhile. If you’ve got nowhere to go anyway. Meanwhile on the other side, the two parts of the Wandle finally meet, water crashing together and being forced through a metal weir. With the two having become one, the Wandle can carry on its way. It splits again at Dale Park where an island sits in the middle, before being quietly reunited a short way on. Houses sit on all sides, but there’s plenty of people using the Wandle. Kids on bikes, people with dogs. This may be a route down to the Thames but most people seem to use the Trail for short leisure journeys instead. After Watercress Park the paths begin to stray away from the river, and at one point the Wandle is hidden away behind bars. The path is quieter here away from the parkland, and more litter strewn. There’s even a pile of building waste dumped in a “discrete” corner of some trees. It’s not the greatest ending for the Sutton stretch of the Wandle Trail. Crossing into Merton, one can only hope that things get better.